Originally published in the WHO Goodwill Ambassador’s Newsletter for the Elimination of Leprosy, Issue No. 70 (October 2014). The information was correct and current at the time of publication. There’s a profound reason why 11 May 2001 means so much to Masako Ueno. Now 87, Masako was born on 18 April 1927 in Ishigaki City in Japan’s southernmost prefecture, Okinawa. In 1940, when she was 13, her father took her to Hoshizuka Keiaien, where she was diagnosed with leprosy. She thought she would be returning home, but awoke the next morning to find her father had gone. Devasted, she only learned decades later of the pain it had caused him to leave her there, as required by Japan’s Leprosy Prevention Law. Her disappearance caused difficulties for those back home. Even though she assumed a false name at the sanatorium to protect her family’s reputation, rumor spread that eating something from their shop would result in a terrible disease. As a result, the business nearly went bankrupt. Masako grew up and married a fellow patient, dreaming that one day they would leave and start a family. What she had not known was that Kiyoshi had been sterilized as a precondition for living with her in the sanatorium’s married quarters. The truth emerged when she saw his bloodied undergarments, and came as a terrible shock. 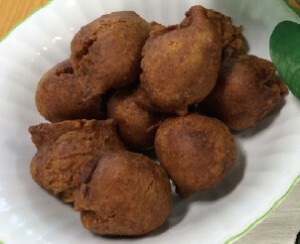 Masako Ueno loves to make sweets, including a type of donut special to Okinawa called sata andagi. The story of her husband’s enforced vasectomy was included in the testimony she gave as one of the original 13 plaintiffs who sued the government for depriving people affected by leprosy of their human rights through its isolation policy. But the plaintiffs won, and from that day on, Masako began using the name her parents had given her. “I consider it my birthday. It had been so painful to live under a pseudonym,” she says. 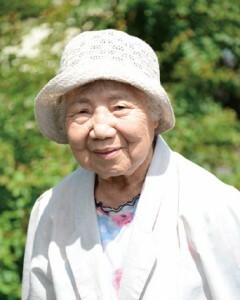 Masako has spent 74 years in Hoshizuka Keiaien. Accounts of her life have been published and she travels throughout Japan, bearing witness to the injustices she and others like her have borne and speaking out for a world without prejudice and discrimination. Once she dreamed of being a teacher; now she addresses students of all ages, passing on the lessons of her life and stressing the preciousness of existence. * Founded in 1935, the sanatorium is located in Kagoshima Prefecture, Japan.